I've been following Midlands-based musician Daniel Trigger for some time now, although this experienced song-writer has been around much longer. I've always appreciated Trigger's song-writing as it usually has, regardless of the overall style, a Melodic Rock foundation to it. His previous three solo albums have seen him push into Heavy Rock territory with slight modern Rock touches and this latest album finds him continuing to do just that! This opus marks something of a change in musical direction (assuming, that is, you're aware of Trigger's recent output), although it's not a complete transformation. He is just fully embracing the Melodic Rock core that sits at the heart of the vast majority of his song-writing. It is, without a doubt, my favourite body of work from Trigger and that isn't me knocking his previous output; it's all about the style with this album being very much closer to my own personal music tastes and sensibilities than his previous releases. Trigger has produced a solid, anthemic Soft Rock album that I've thoroughly enjoyed and I'm sure it will also be equally appreciated by my fellow Melodic Rock enthusiasts. This artist has a great ear for creating commercial songs full of unforgettable melodies, hooks and big sing-along choruses. They are well crafted with lots of exemplary guitar work and an overall feel-good tone that is perfect for a summer's day. Lyrically, I noticed a nostalgic and retrospective theme running throughout, and his thoughtful and emotive words are easy to relate to. The song quality really is sublime, and with every listen, I know this album will have longevity and I will return to it time and again. 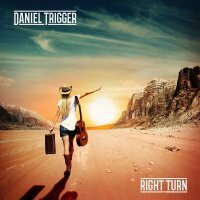 Daniel Trigger employs a lot of acoustic guitar which seems to give these tracks a lot of life and freshness. There is a nineties-era Bon Jovi feel to some of the songs, but I would say this is more inspired by the golden era of Melodic Rock in general. This feel-good, dance-inducing, sing-along album should be appreciated by fans of Bon Jovi, Richard Marx, John Waite and Bryan Adams. It gives us anthem after anthem of Melodic Rock goodness and must be one of the standout releases of the year! Don't let this one pass you by; trust me, you won't be disappointed.